When you imagine the day you give birth, you probably think about being surrounded by family, maybe friends, and of course your doctor or midwife. But in reality, there are lots of potential people involved who may attend your birth. Monty Python's The Meaning of Life had the scene nearly perfect when they let everyone come in the room, but tell the father, "Only people involved with the birth allowed..."
In truth, most hospitals and birth centers are not this bad, but there are still some out there with very strict protocols about who can attend the birth of your baby. Here is a brief introduction to potential attendees to your birth. This is usually someone you have met and developed a relationship with prior to giving birth. Hopefully, it is your main practitioner or at least one with whom you have developed a relationship. Be sure to ask your doctor or midwife about their call schedule. Do they have back-ups? Can you meet them? Do they have any vacations or time off near the time of your due date? The chance of actually getting your practitioner will depend on the above factors. Being able to meet any back-ups will greatly ease your mind. This will also allow you to go over any specific requests or birth plans, prior to your due date. You might believe it is a given that your partner is invited into the delivery room at your local hospital or birth center. This is not always true. Be sure to learn your facilities policy. In some facilities, you must have your partner attend a special class to be allowed to attend your birth. This is particularly true if you are having a cesarean (planned or unplanned). Hiring a doula can help you reduce your risks of certain interventions. Many hospitals or birth centers have no restrictions on the use of a doula. However, if your facility has a limit to the number of people you can invite to your birth, most do not count the doula in this number, because they recognize the value of the doula's role. This is true even of a cesarean birth. Your labor nurse will be your direct link to the facility where you are giving birth. You may have the same nurse for your entire labor and birth, or you may, because of shifts or multiple patients, see more than one nurse. The nurse will be responsible for communicating with your doctor or midwife and letting them know how your labor is progressing and relaying any requests that you have back to the practitioner. They will also attend your birth to assist your doctor and others in the room. The labor nurse will be responsible for blood work, paperwork, monitoring, vaginal exams, etc. She may or may not have more than one patient. Very little of her time is usually spent on physical comfort measures for your labor, but she can provide you with suggestions for comfort in labor from positioning to medications. The OB Tech comes in at the very end to set up a table of instruments and things to be used at your birth, like gauze, oils for perineal massage, scissors, and suture material. The OB tech's main job is to assist your doctor or midwife in the actual birth. You will usually not have a chance to meet them beforehand. Some places also have a nursery nurse attend the birth of your baby. 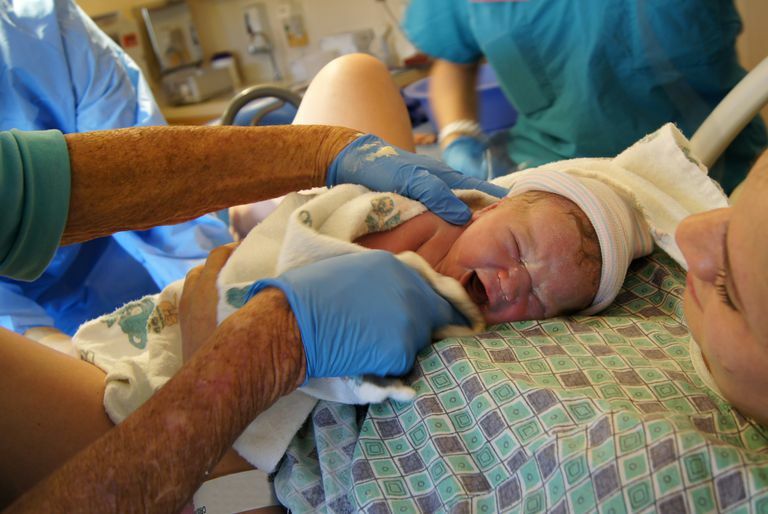 In some facilities, they attend every birth, in others, only cesarean births. Ask your facility for their policy. This nurse is someone who will come at the end specifically to care for your new baby( or babies). There are many potential specialists who could potentially be available for your birth. These can include but are not limited to the anesthesiologist for epidurals, spinal, and other medications; pediatrician, to care for your baby; neonatologist, specialized care for at-risk newborns; assistant surgeons, particularly used for cesarean births; medical students, nursing students, residents in OB, Family Practice, etc. Ask about your facility's policy for students at birth. Be sure to talk to the place where you are giving birth to find out all policies about who can attend your birth and what, if any, special training they are required to have. This can be particularly true for siblings. If you are planning on a homebirth, talk to your midwife or doctor about who you are able to invite to the birth and if they need special training. Also be sure to ask who they bring with them to attend the birth, other midwives or physicians, apprentices, doulas, etc. Many families choose to give birth at home to allow them more freedom as to whom they may invite to the birth of their child.